The term “hot hand” originates from basketball, where a player’s probability of hitting a free throw is believed to be higher after a hit than a miss on the previous shot. In sports betting scenarios, the term is used to describe a bettor with a persistent winning record. But is the mysterious “hot hand” scientifically proven? A research conducted by Juemin Xu and Nigel Harvey at University College London investigated the hot hand effect, by examining the betting history of over 700 players who placed a combined number of 565,915 bets over the course of 2010. 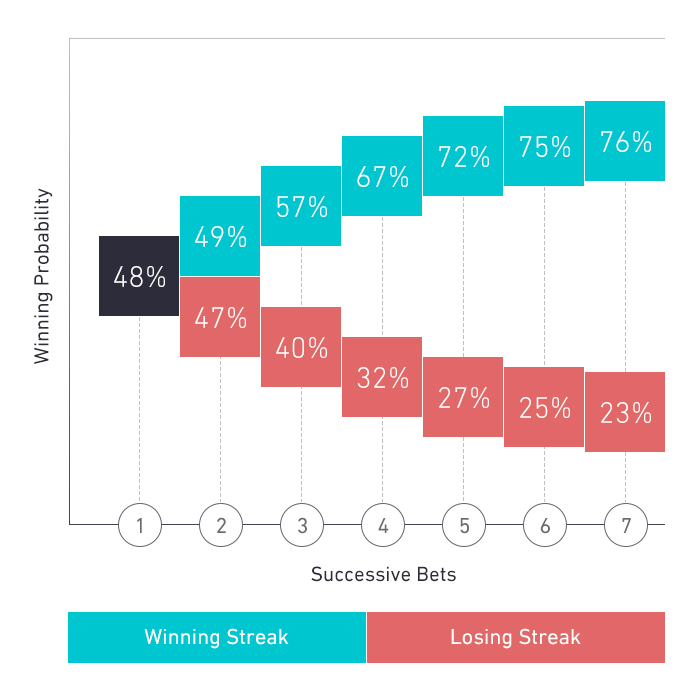 The researchers examined the phenomenon of winning streaks in betting by assessing the probability of winning after different lengths of previous wins. In the first random sample of bets the probability of winning was 0.48. After examining the following bet of the same players, the probability of the winning players to have another win was 0.49. In comparison, the probability of a losing player to get a win was 0.47. It wasn’t until the players with two consecutive wins were examined that a pattern started to emerge. The probability of winning a third bet in a row rose to a remarkable 0.57. In contrast, the players without a winning streak, showed a probability of winning of 0.45. By checking the results of the next bet of the players who had tree consecutive wins, the probability of a fourth win went up again to 0.67. The players without the run of lucky predecessors, however, exhibited a probability of winning of only 0.45. The same procedure continued, showing that players with a winning streak of five bets had a staggering probability of winning of 0.72, whereas the players who had lost on the immediately preceding occasion had a winning probability of 0.45. From a statistical point of view, subsequent outcomes are independent from each other. The examination of the following bets showed a further improved probability of winning for players with six wins in a row, at a probability of 0.75. Those without a run of lucky bets though had a probability of winning of only 0.46. Lastly, the players with a winning streak of six bets, exhibited once again an improved probability of winning the next bet at 0.76, whereas the probability of winning for those without a win in the previous round was a mere 0.47. In the second phase, the research focused on losing streaks. The probability of winning after a losing bet was measured at 0.47, which deteriorated to 0.40 following two consecutive losses. By repeating the same procedure, the researchers found that those with 3 losses in a row had a probability of winning of only 0.32. Following the same steps, they found that the probability of winning after five, six and seven lost bets in a row were 0.27, 0.25 and 0.23 respectively. The data strongly suggested the existence of a hot hand effect in betting, but is it true that bettors with long winning streaks are consistently luckier than others or is there another explanation hiding behind the façade of logic? From a statistical point of view, subsequent outcomes are independent from each other. It is, therefore, surprising that Xu and Harvey found evidence in support of the hot hand effect. In the next experiment, the research focused on how the result of a bet affected the odds of the next bet. In the first phase, the mean level of selected odds of all bettors was 7.72. After the first bet, though, significant changes were observed. The winners exhibited the tendency to choose lower bets, with the mean odds decreasing to 3.60. As the consecutive wins continued, the trend of less risky odds continued too. What the experiment proved was that by believing in the gambler’s fallacy, bettors created their own luck. The opposite was found for losing bets. Those who had lost on more consecutive occasions, tended to select riskier odds. After six winning bets in a row, the figure for mean odds dropped to 0.85, as opposed to 17.07 for bettors with six losses in a row. What the experiment proved was that by believing in the gambler’s fallacy, bettors created their own luck. Winners worried about running out of luck and selected safer odds. By getting more risk averse, they also became more likely to win. The losing bettors, on the other hand, took riskier odds in the belief that the big win is just around the corner, making themselves even more likely to lose. And the million-dollar question of course is whether the winning-streak players were more profitable than non-streaky ones. By comparing the overall returns for bettors who had at least one streak of six successful bets in a row and for those who didn’t, the difference showed that non-streaky bettors were marginally better off, with winning-streak players having an average loss of £1.0078 for each pound they bet and non-streaky ones an almost identical of £1.0077. So, whether you are on a winning or a losing streak, I have one piece of advice for you. Don’t believe everything you think. ← Predictive skills – Are you a Fox or Hedgehog?